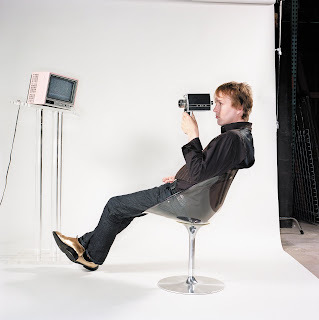 Chuck Prophet returns to the Narrows in July! It was blues harmonica night, as Mark Hummel led his latest grouping of harp hotshots to the Narrows Saturday. Muddy Waters and Eric Clapton associate Jerry Portnoy, above, former Robert Cray, Santana and Roomful of Blues harmonicat Curtis Salgado and Rick Estrin (you might know him from Lil' Charlie and the Nightcats), did the honors, making up the latest version of Mark Hummel's Blues Harmonica Blowouts. That's Lil' Charlie's J. Hansen on the drums, by the way. They're rootsy, wacky and wild--The Asylum Street Spankers. Coming in July for their second appearance ever at the Narrows. It you're like me, you don't jump every time Eric Clapton releases a record or goes on tour. Clapton, of course, is fabulous but hasn't captured your humble blogger's imagination much. I would rather get my blues from Sonny Landreth, Paul Geremia, and newcomer Mark T. Small, or from the originators like Howlin' Wolf, Muddy Waters, Elmore James etc. But Mr. Clapton's autobiography, which he apparently truly wrote himself, is a terrific book about music and how he spent most of his life messing up personally. I picked it up at the Providence Public Library, where they have a bunch of copies. Fun facts in Clapton: The Autobiography: Clapton owns a house in Columbus, Ohio, where his wife is from; he thinks Stephen Bishop is one of the greatest singer/songwriters; his friendship with George Harrison has been overstated; and he's not really into the "guitar hero" thing. In case you missed it, Danny Federici, who played with Bruce Springsteen as a member of the E-Street Band, died a few days back. The story from the New York Times is here. Our guy Pierre Bensusan--who played the Narrows a mere few weeks ago--has won a reader's choice award from Guitar Player magazine. It's in the May issue, which might not yet be out. Congrats to Pierre! The photo above is, left, Narrows prez Patrick Norton with Pierre taken moments before the concert. To read a Guitar Player article from last year about Pierre, click here. Jazz guitar guy Charlie Hunter brought his crew to the Narrows Friday night, playing, for the most part, understated instrumental improvisations. We counted 7 strings on his guitar and two cables leading to a couple amps--one for his bass strings and one for the rest. Charlie literally was playing bass and lead at the same time, accompanied by a fab jazz skinsman and a funky keyboard guy often playing an organ that sounded like it would be at home in an old roller rink or on a surf record. Though you might call it progressive jazz, the trio slipped into an extended version of Duran Duran's "Hungry Like A Wolf" which somehow transformed into Donovan's "Sunshine Superman." And unless we're mistaken, we heard Charlie slip in the riff of the Beatles' "In My Life" in one of his noodlings. R & B singer/keyboardist Marcia Ball brought her New Orleans joy to the Narrows on Thursday night. It was the first appearance for this beloved performer, who pretty much sold out the place! She noted that Fall River, Massachusetts--the Narrows' hometown--has long been in her thoughts because she was educated as a young girl in Louisiana by the Sisters of St. Joseph "from Fall River, Massachusetts." She is touring in support of her new CD "Peace, Love and BBQ." But she pointed out that she's been touring, for all intents and purposes, "since 1981." 19-year-old Berklee student Emily Elbert opened the show, winning the crowd with her singing, guitar and songwriting chops. That's her below. Providence Phoenix Poll: Narrows The Best! It hit the street today: the Providence Phoenix "best of" results. Thanks to the votes of our loyal supporters, the Narrows has been named "Best Folk Venue." This is more than a stroke to our egos. It helps us get the word out that the Narrows is worth checking out. The more we build our audience the more likely we'll survive for years to come. On behalf of Narrows president Patrick Norton, administrator Deb Charlebois and all the volunteers: Thank you!!! 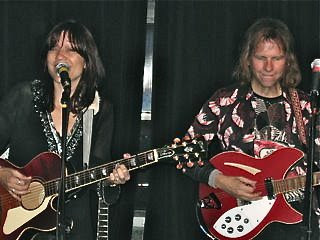 Not yet posted: husband-and-wife folk-rock duo The Kennedys return to the Narrows in September. Visit www.ncfta.org for the listing soon. The above photo is from their 2006 visit to the Narrows. Interesting night, Saturday night at the Narrows. An unknown opener scratching and pawing on acoustic instruments, in homage to Son House, Bukka White et.al. And then the featured act taking blues into the electronic stratosphere--while scratching and pawing too! The young performer Samuel James (in the photo above) set the roots tone, mixing off-beat originals and hard-to-find folk blues with a youthful, very new century perspective. The sold-out night's star, Sonny Landreth, plugged in the roots, added drums and bass and blasted off toward another planet, breaking the sound barrier with his fingers. Clearly, one of the best concerts of 2008 at the Narrows and probably around the world. Britney Spears and I have a lot of similarities, said Leo Kottke, Friday night at the Narrows. "But the differences are profound." And so it went during the sold-out show, winding between intricate fret work and off-beat stories involving woodpeckers, Stevie Winwood and jazz great Dizzy Gillespie loading a car with a drum set at dawn in Milan, Italy. The photo above was taken about a half hour before the concert, in the Narrows "green room." Can I take your picture? I asked. "As long as I don't have to move," said the thoroughly relaxed Leo, who was reading the writings of Samuel Beckett. Thursday night saw the grand opening of the multi-media exhibit "Experiencing the War in Iraq." Music provided by Haale. Karla Bonoff & Patty Larkin Coming! Karla Bonoff is coming to the Narrows September 12. Patty Larkin, October 3! 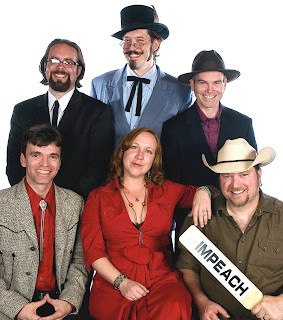 Narrows alums Donna Jean and the Tricksters have gotten a big thumb's up from David Fricke of Rolling Stone. 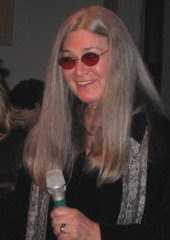 Donna Jean, as you may be aware, was a member of the Grateful Dead for a good long time. Anyway, Fricke writes "Fricke's Picks" and he picked her and her crew. The photo is from a visit to the Narrows in 2007. The Narrows, on Saturday night, was pleased to host the celebrated New England bluegrass group, Northern Lights. Above them are flags representing American casualties in Iraq as part of a new multi-media exhibit at the Narrows. Your humble Backstage Blogger had the honor of taking some photos before the opening of the dramatic new art exhibit at the Narrows "Experiencing the War in Iraq." It's a multi-media exhibit that opens April 10 and continues through May 3. It includes thousands of flags representing American casualties. The Wood Brothers, coming to the Narrows in May, have a new CD out. To read a review from Paste Magazine, click here. Acoustic guitar master Pierre Bensusan, who played the Narrows recently, has uploaded a new performance video onto YouTube. It was recorded live in Paris shortly before he headed for his current tour of the USA. The video, by the way, is a close up of his fretwork, etc. so it's particularly interesting. 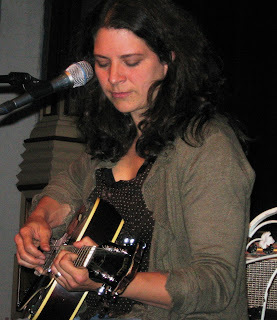 Kris Delmhorst is the "Shotgun Singer"
Narrows alum Kris Delmhorst has released a new CD called "Shotgun Singer." Your very humble Backstage Blogger caught a track off of it on WUMB this afternoon. Sounded very lush, which is Kris' approach on record in some instances. Over there is a photo of Kris at the Narrows in 2007. By the way, WUMB sounds pretty much the same, despite the announcement that they're going to "brighten" their sound and drop the "folk radio" moniker. Got word that Narrows faves Sarah Borges and the Broken Singles are demo-ing songs for their NEW RECORD!! Also, this summer they head to the U.K. and Germany. As well as the Narrows soon. Visit www.ncfta.org for details.